This weekend marks the 20th anniversary of the ‘Le Jog’ rally, the challenging British winter rally which covers a distance of 2,400 kilometres. For the first time, a car from Volkswagen Classic is among the 66 racing vehicles: a courageous team of two ladies will tackle the three-day rough-and-tumble endurance rally in a Volkswagen Iltis. Sixty-six teams will compete in the rally from the 7th to 10th December. 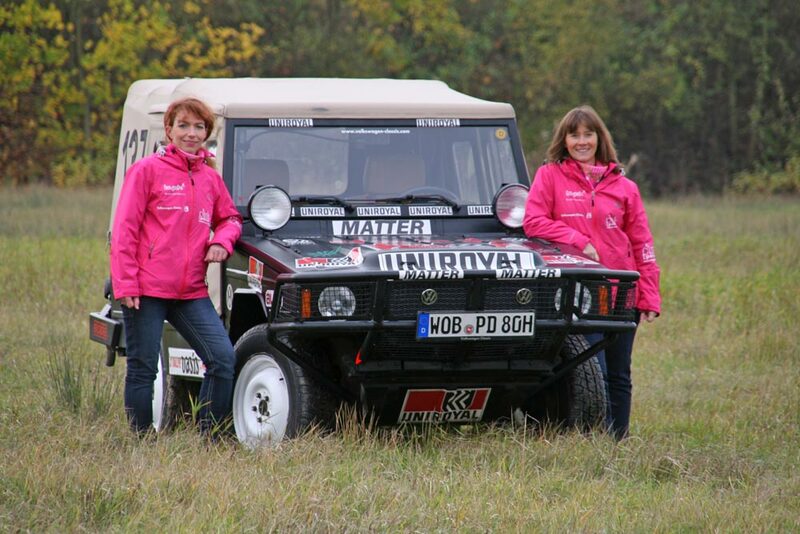 In 2013 for the first time, a ladies team with a vehicle from the collection of Volkswagen Classic is competing in the 2,400-kilometre tour – a “Paris-Dakar” Volkswagen Iltis, just like the one that Freddy Graf Kottulinsky/ Gerhard Löffelmann drove to victory in that legendary desert rally in 1980. Steffi Edelhoff and Sandra Wukovich, who have already toured the world in a Volkswagen Amarok, are racing in the ‘Le Jog’ for a good cause: jointly with the “be your own hero e.V.”, a registered non-profit organisation that campaigns for the autonomy and self-reliance of girls and young women. Just under 10,000 of the four-wheel drive Iltis (Type 183) were produced by Volkswagen/Audi. The technology of this spartan vehicle went on to form the basis for Audi’s now legendary Quattro models. The race car differs from the production version with a reinforced chassis, underbody protection, front safety guard, auxiliary lamps, roll-over protection bar, only two sports bucket seats and a big 90-litre fuel tank. The ‘Le Jog’ winter rally has been staged in the United Kingdom since 1993: ‘the toughest in Europe’ as the organiser says himself. The challenge is to drive from Land’s End to John O’Groats within three days. The demanding route runs straight over very bumpy byroads and through streams, which means – given the extremely short passage times as well as a thoroughly strenuous nocturnal stage – that the drivers and their vehicles will be tested fully by the automotive ordeal. The whole route is garnished with more than 50 special regularity tests full of navigational dodges.